Find key public affairs executives in corporate America's largest companies! Now with intensified, year-round research, the directory delivers even more information on the public and government affairs programs of American largest corporations. It's filled with facts that are nearly impossible to get because unlike federal lobbying, disclosure isn't required. But now, you'll have the "inside access" you need to zero in on the people and relationships between lobbying firms, clients, and issues. Direct-line information has always made the directory indispensable. Now new expanded content makes it even more valuable to your work. In addition to companies with $500 million in revenues and a Washington public affairs office; you'll now have details on all corporations that employ a federal lobbyist. Nearly 3,300 Corporations - including their political fundraising groups. 40% more executives - You'll find direct contact information for over 24,000 executives involved in charitable affairs, public and media relations, marketing and issues management, legal and regulatory compliance and human resources. You'll have access to phone numbers, mailing addresses, email addresses, and much more. More facts on each company including the number of employees, SIC and NAICS codes, and ticker symbol in addition to details on their public affairs programs. More legislative/regulatory affairs personnel titles - You can now pinpoint each corporation's Chief Legal Counsel and Compliance Officer - plus at-a-glance access to specific legislative issues of interest and the FEC registration number for connected PACs. 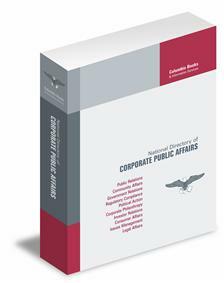 As you know, information about corporate public affairs programs and personnel isn't readily available. But it's essential. Now, the dramatically expanded directory opens your access to corporate lobbying, PR, and public affairs. Make connections, find donors, spot opportunities and assess colleagues, competitors and opponents. 36th Edition - Now Shipping!